I got a truly amazing surprise in the post all the way from Ireland this week! 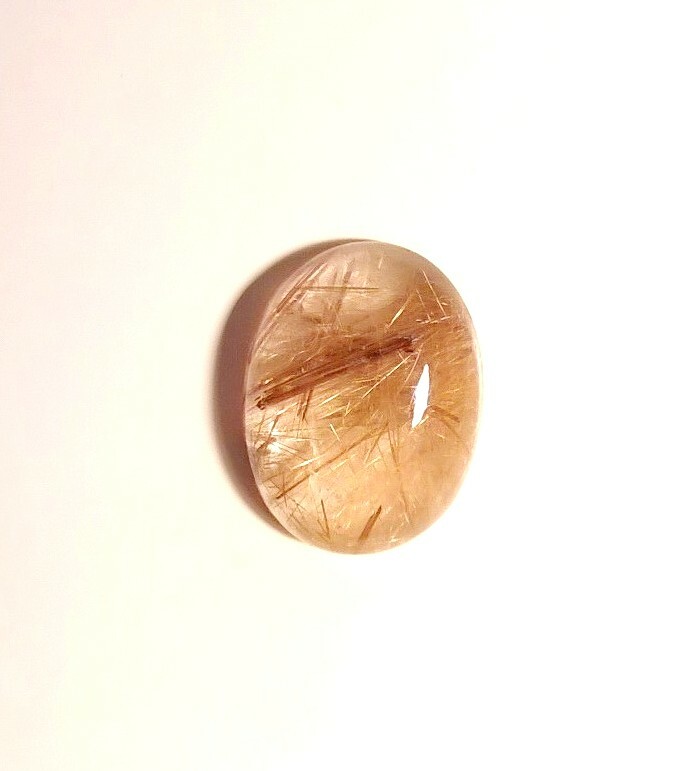 My friend Clare Barman said she had a few gemstones that she wanted to give to me, as I might have some use for them. She bought them in India over twenty years ago when she was there with her friend Simon Phelan, a Dublin-based jewellery designer who runs Djinn Jewellery on Wexford Street. But Clare actually sent me a lot more than a few gemstones. I could make about a hundred pieces of jewellery with these! So incredibly generous, but then again Clare is never anything else. I actually have inventory now! THANK YOU CLARE!!! As luck would have it I’m currently working on a stone setting project so I brought them into class to see if they might be suitable for some designs I had sketched. Ignacio’s reaction when he saw my bountiful supply of stones reminded me of me in a gelateria. 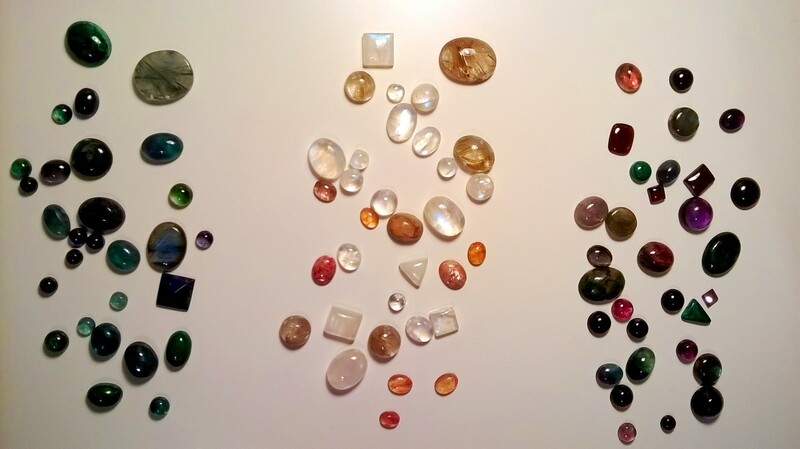 He went through the multi-coloured gems, carefully examining each of them and telling me which ones would be suitable for earrings, rings, pins or pendants. Certain stones are perfect for statement pieces of jewellery. He told me that one in particular will have to be kept aside to use in an ornate gold ring or pendant, and would return again to my bench to admire it… ‘una bella pietra’. I was a bit dazzled by the sudden abundance of choice spread out before me, so Ignacio told me to select just a couple of stones and put the rest away, in order to focus my mind on what I could do with those particular stones. 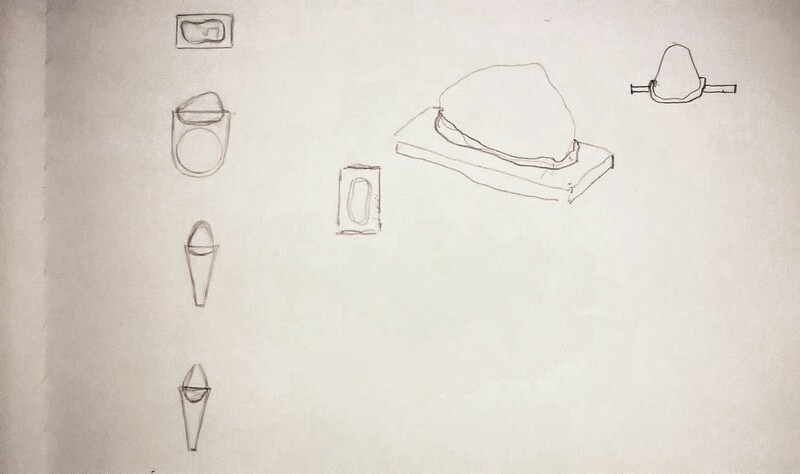 The design would change depending on the individual qualities of the stones chosen, because their shape, colour or opacity might call for different setting methods. 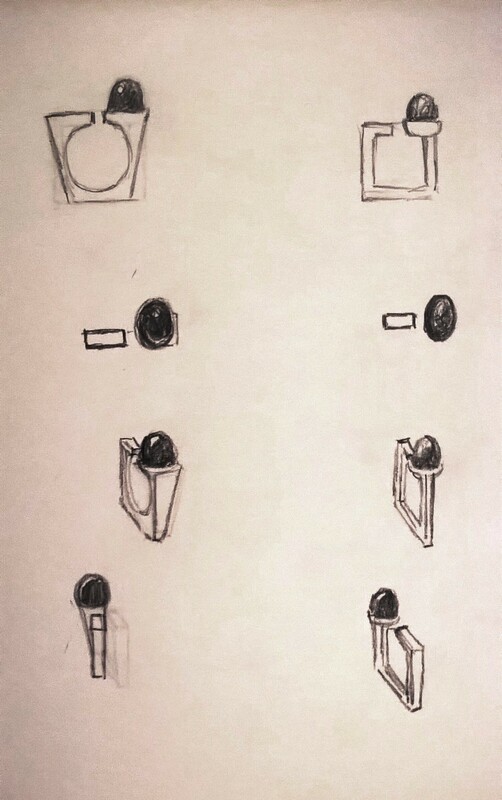 I had already done some drawings for stones I had acquired before the Irish parcel arrived, and Ignacio talked to me about problems I might have with such designs so I did a few more sketches based on his advice. I decided to go ahead with a design for one of my old gemstones, and do a new drawing for one of Clare’s. I dipped both stones in hot red wax to make the nest which will ultimately be cast in silver and incorporated into the designs. If this wasn’t enough to keep me occupied, I was also making wax copies of the bombato ring from my first post, which I had already collected from the foundry. It took some time but I filed off the rough edges, cleaned it up to a high polish finish and made a silicone mould of it. This is why I need to be more diligent when it comes to writing regular blog posts! So much happens in a short space of time I end up having a backlog of information to remember and document. And because I’m learning through Italian I don’t always grasp the correct terminology for the equipment and techniques I’m using, so inevitably I read back over my notes and see ‘put the thing that looks like x, into the other thing that heats up, making sure thing y and z are facing the same direction’ (diagrams and arrows abound). ‘Qual è la parola per questo’ (what is the word for this) is probably my most used phrase at the moment, and when I get the word I scribble it down, so among the ‘things x, y and z’ there’s the odd Italian word which I then look up in my dictionary. Usually I find a word that is not what I expected, and I wonder if my dictionary just doesn’t contain the terminology I need. I could be talking complete gibberish and I’ll never know. Anyway, I digress. 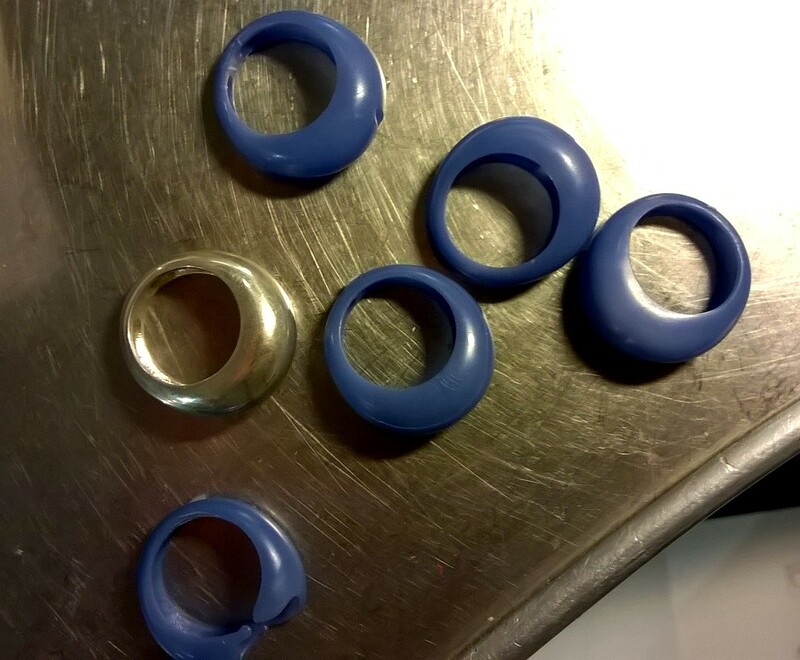 I made a blue silicone mould of the finished bombato ring in a metal staffa (stirrup?!) and cooked it in the vulcanising press for about 50 minutes to set the silicone. 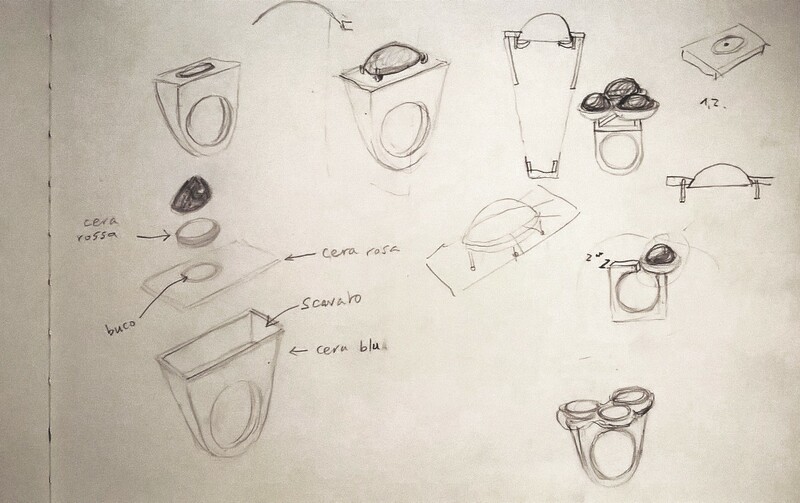 Once it had cooled Ignacio went about cutting the mould open to release the ring, taking care to cut out the central piece of silicone in two parts with surgical precision. I then reassembled the mould and was introduced to the hot wax injection machine. 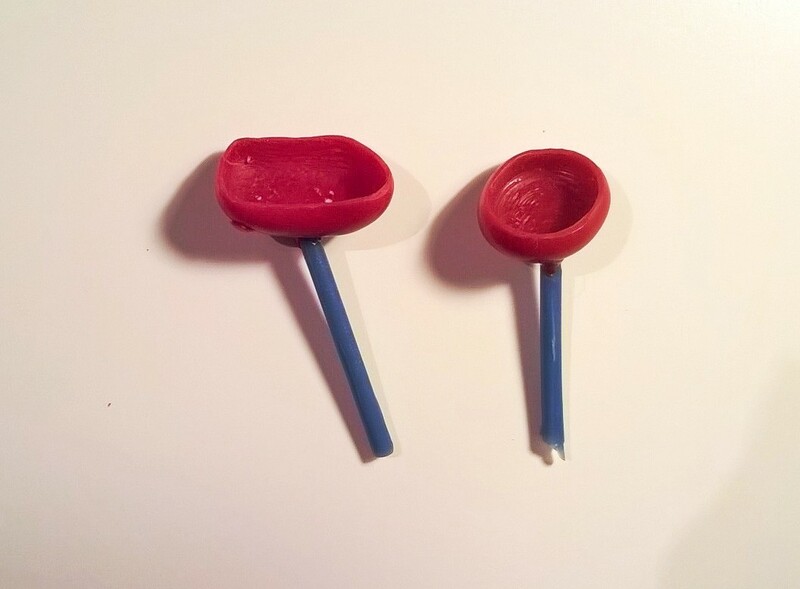 It is used to fill moulds with hot wax to create multiples, but it is not an exact science, more trial and error, until you get the result you need. Adjust the temperature, inject the wax into the mould, see what happens. Adjust the pressure, inject the wax into the mould, see what happens. I ended up with a few copies, none of them good! So more experimentation is needed on that front to achieve perfection. One of the other students in the class was also using the wax injection machine to produce copies of a complicated 3D printed geometric design he had created. He wasn’t having much success either. His name is Ricky, he’s Japanese but speaks a little bit of English and is always very friendly. He said my failed wax copies looked great and also alerted me to the presence of some strawberry cheesecake which some generous person had brought into the studio for us. Then, when I was a bit standoffish because so many people were milling around the table, he grabbed a napkin for me, loaded it with cake and gave me a fork. What a star! This is something I will go into at a later date, but I thought I’d just give it a quick mention now. The early stages of learning a language really deprive you of the ability to interact with others in a friendly manner. You are so preoccupied trying to remember vocabulary and grammatical rules that you can’t really respond in a natural way or ask questions which might engage the other person in conversation. Sometimes I can chat without even thinking about it too much, other times my speech is extremely stilted. The ability to be humorous is stifled, because it’s not easy to be quick-witted with a slow mouth. In a sense you revert to being a socially awkward teenager, who over-thinks everything and cringes later at the stupid things you said. So a couple of words in English means a lot when you’re wax models are a bit of a disaster and you can’t even think of the words to describe how bad they are! And a kind gesture is appreciated when you really would like a piece of cake but you can’t remember the formal way to ask someone to get out of your way! 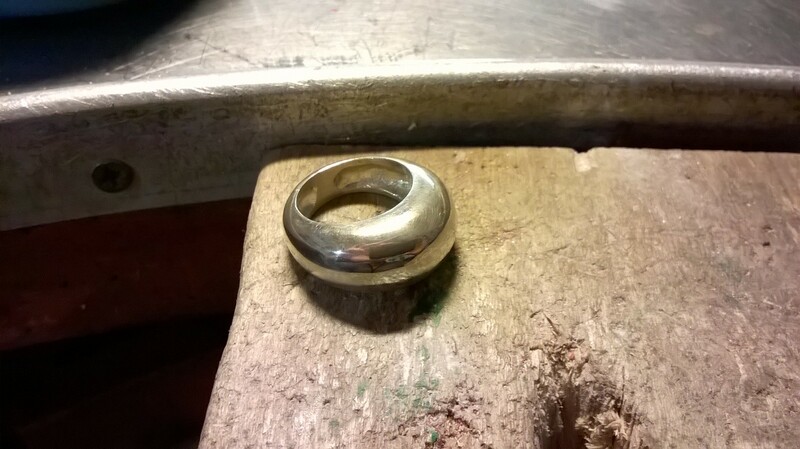 Thank you for another excellent post and a really enjoyable journey through the different stages of making jewellery (and learning a new language). Me too! A lot of work but worth it!